First of all, remember to plan the right holiday for you, not merely the right one for everyone else. This is your time too. Whether a winter ski week in Canada is calling your name or the ancient ruins in Mexico are beckoning make sure it’s the holiday that you, as well as those who are with you, will enjoy. Let’s face it: we all have dream destinations that we can’t currently afford. If you’re maxing out with flights and accommodation make sure you have also taken into account the cost of living over there. Keep in mind you’ll only ruin your hols if you constantly find yourself worrying about the costs of things at those moments when you are supposed to be enjoying the sights and creating lifetime memories. If you're tempted to take the risk with your credit card make sure you can afford to pay it back when you get home. Another invaluable piece of holiday planning advice is to research your destination. You may see yourself as the more spontaneous type rather than someone who plans every aspect of their itinerary, but many trips only last for a few days. Don't waste them by struggling to find your way around, finding out what there is to do or how to get to and from places. Do you know how much things cost in a foreign currency? Do you know if you can use 5,000 of your foreign currency to buy a chocolate bar or a car? Your holiday will be much more successful if you change your money in advance. Buying online can help you to get the best rates and some providers will even deliver it directly to your door or allow you to pick it up at the airport when you jet off! I once made the mistake of checking in at Gatwick with an out of date passport - doh! Lesson was learned and I have (so far) never made that mistake again. Make sure your passport is in date and has 6 months left before it expires. I am typing this with one arm as my other is rather heavy and non respondent. The reason? Hepatitis A booster job. Ouch! No matter how much you hate needles it's best to check with the doctor as to what jabs you need (if any) at least a month before you travel especially if it's somewhere exotic. We don’t like to think of anything bad happening on our hols, but nonetheless it’s important to have travel insurance, just in case. Accidents do happen and some hospitals require a cash payment upfront before they’ll treat you. Many providers offer single trip insurance as well as an array of other variables and you can usually apply online. It's worth checking whether you need a visa to get into the country you are going. 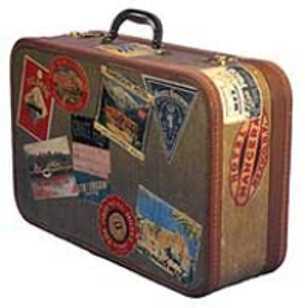 Some visas need purchasing in advance and others can be done when you arrive. You never know how sunny it will be. No matter whether you are beaching it in Miami or skiing in the Alps, it's certainly worth packing a high/semi high SPF sunscreen. If you were to lose your drivers licence, passport or travel tickets, you could find yourself in a really sticky situation. Make photocopies of all your important documents and keep them in the safe in your room and/or with friends/family at home so they can fax them over should anything happen to your originals. I take photos of my documents on my iphone and email myself - just in case. I hope I haven't put you off from going on your hols but as my mother always says, it's better being safe rather than sorry!